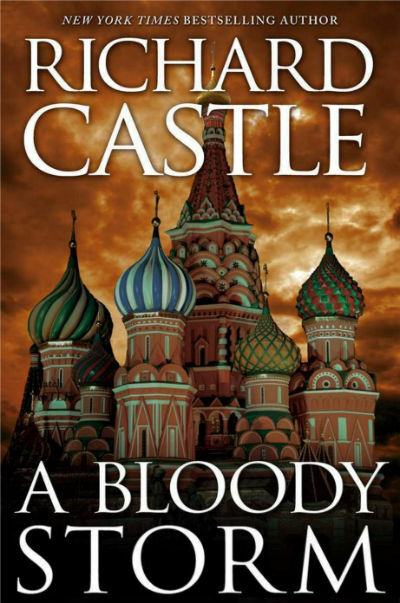 A Bloody Storm is the third (and final) Derrick Storm short by fictional writer Richard Castle, which moves the story ahead from where it was left in A Raging Storm. It is worth to note that, you will end up thinking to have more shorts coming your way. Storm is able to cash the car in the compound walls and though bathed in the blood, be able to drag Showers from the crime scene to a hospital. The description of these scenes is well written. As a spy Storm is bound to do the things in the right way, so without getting emotional, after sending Showers in proper hands, he left for his destination. How, he is reached back to USA is then a thrilling sequence. The way Showers approached by the authorities when she get back to her senses (in the hospital), is good to read. It will let you know that how the field agents are supported and trained to behave in some politically tricky situations. Sometimes, it is worth to not to spill the beans and create politically complicated situations between the countries. The things went as per the plans, and she is also en route to the air base, from where she can return to USA. But, she was abducted on the motor-way!!! Dilya, a native of Uzbekistan, working undercover for CIA. Oscar, a Russian geologist, who can authenticate the treasure. Casper, a former field agent like Storm, who is also declared officially “dead” (again, like Storm). There is one more thing which links them all. They were all linked to the Tangiers mission, where their cover was blown and Storm was almost met with his death! Now the team without Storm can do what it needs to, based on the abilities of the team members, so what makes him the part of the team?! Well, to Jedidah, Storm is the one whom he can trust. He is chosen to keep an eye on all. And, we somehow got to know the Jedidah wants to know that, who was the culprit at Tangiers?! How they are sent to Kazakhstan and how they cross the borders to go to the target cave inside the mountains, is written nicely. While this is being happened, Showers was taken to some remote place and was under the eye of a psycho guard, who keeps reading new books and invent new ways to torture! Will she be able to find her location or get out of the place where she is kept? And how (if) Storm’s mission is linking to it?! Will they meet again? All these stuff is explored in the rest of the book. This short is comparatively longer than the previous two instalments as it has to justify many events and link the dots. The writer seems to be in full form and enjoy writing this spy thriller. The chases are written well and the plans are put brilliantly. The human side of Jones is explored in a few sentences. A couple of good scenes we like to mention but they will be spoilers, so let us avoid them. The height of the thriller is where we see all the four team members are finding their target inside the mountain cave, and eventually everybody suspects a foul play by the others. It will remind you some of the classics like And Then There Were None. Also the way Jones allot some hi-tech gadgets, the impression of James Bond (books and movies) is clearly seen. The character of Clara Strike makes her presence felt in this book also (via flashbacks). The book have very few dull moments. However some things are melodramatic, like injured Showers is able to do some hard work (well, we cannot go into specifics to avoid spoilers). It is quite filmy. But, the spy fictions have many such things right? Overall it is a nicely written short, even better than both the previous instalments of the trilogy, this book is worth to go for, if you like the spy fictions. So, that’s all for the Derrick Storm shorts trilogy! Are you curious to explore it? Did you read all or any of these books yet? Do you think more books in this series should come out? Do you feel that the writer who is writing under this pseudonym should reveal his/her actual identity? You are welcome to share your thoughts via comments below. Soon we are going to start exploring the Nikki Heat series. The first in the segment will be the book Heat Wave. If you like to get updates for each new article published at ThinkerViews.com, you can subscribe to our RSS Feeds. Did you find this review helpful? Share all your remarks with us via comments bellow. You can follow us on Twitter, Facebook and other social networks. And do not forget to share this article with your friends also.